Summer 2014FEAMC Jubilee ! Eté 2014La FEAMC a 50 ans ! It is in Malta, from September 7 to 10, 1964 (10 days before independence), that the 1st European Congress of Catholic Doctors took place, on the theme “The Catholic physician and the family”. It gathered 400 doctors of fifteen European countries, who were joined by representatives of the United States and Australia. With the exception of the first day, most of the discussions were about birth control. This topic may be discussed again next October by the Synod of the Pontifical Council for the Family. The profound transformation of the world during the last 50 years, particularly marked by the increases in world population and in life expectancy, are perhaps not without impact on the look that can be brought again on it. • 130 years ago, in September and October 1884, in a climate of acute beginning dechristianization were founded the first two associations of Catholic doctors (in France and Catalonia), which were followed by many others. • 110 years ago, in April 1904 took place the first international pilgrimage of the Catholic doctors to Rome. More than 200 of them were welcomed there by the Holy Father Pius X. The creation of an international federation, unanimously approved there, was unfortunately a short-lived attempt. 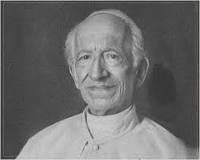 • 100 years ago, in August 1914, broke out World War I, which Benedict XV – aware of the seriousness of this conflict inside the “christian” Europe – did not succeed to stop. • 90 years ago, in April 1924 in Paris, Dr. 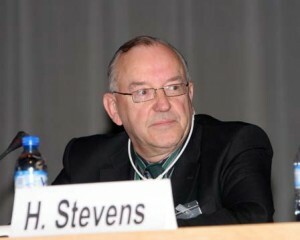 Octave Pasteau created – with the blessing of the Holy See – the “International Secretariat of National Associations of Catholic Doctors”. Its first International Congress was held in Brussels in May 1935. 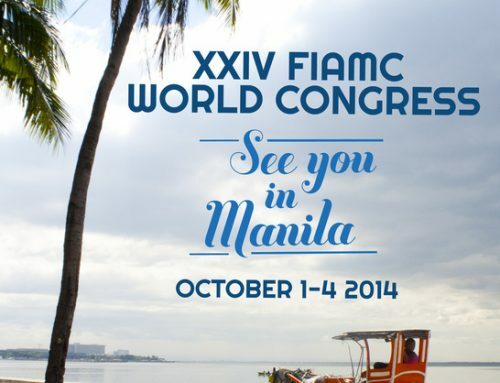 The creation of FIAMC itself dates only from the 11th International Congress in 1966 in Manila, where our next World Congress is going to take place. • 25 years ago, on the 9th November 1989, the fall of the Berlin Wall was the prelude to the opening of Eastern Europe borders, and many countries could then join the FEAMC (Poland, Czech Republic, Slovakia, Hungary, Slovenia, Croatia, Romania, Ukraine, Lithuania …) almost doubling its original size, and renewing its strength. After the FIAMC World Congress in Manilanext October, our next European meeting will be held late November in Vienna, where we we had not met since 1991. President of FEAMC C’est à Malte, du 7 au 10 septembre 1964 (10 jours avant l’indépendance),qu’eut lieu le 1er Congrès Européen de Médecins Catholiques, sur le thème “Le médecin Catholique et la famille”. Il réunit 400 médecins d’une quinzaine de pays européens, auxquels s’étaient joints des représentants des Etats-Unis et d’Australie. A l’exception du 1er jour, la majeure partie des discussions porta sur le contrôle des naissances. Ce sujet sera peut-être encore abordé en octobre prochain par le synode du Conseil Pontifical pour la Famille. La transformation profonde de la société au cours de ces 50 dernières années, notamment marquée par l’accroissement de la population mondiale, et l’allongement de l’espérance de vie, n’est peut-être pas sans incidence sur le regard qu’on peut encore y porter. • Il y a 130 ans, en septembre et octobre 1884, dans un climat de déchristianisation aigue débutante furent fondées les deux premières associations de médecins catholiques (en France, et en Catalogne), qui devaient être suivies de beaucoup d’autres. • Il y a 110 ans, en avril 1904, eut lieu le 1er pélerinage international des médecins catholiques à Rome. Plus de 200 d’entre eux y furent accueillis par le St-Père Pie X. La création d’une fédération internationale, votée à l’unanimité, n’y fut malheureusement qu’une tentative sans lendemain. • Il y a 100 ans, éclata la guerre de 1914, que Benoît XV – conscient de la gravité de cette déchirure de l’Europe chrétienne! – ne parvint pas à arrêter. • Il y a 90 ans, en avril 1924, à Paris, le Dr Octave Pasteau créa – avec la bénédiction du St-Siège – le “Secrétariat International des Associations Nationales des Médecins Catholiques”, à l’origine du 1er Congrès International qui eut lieu à Bruxelles en mai 1935, et des Congrès suivants. La création de la FIAMC elle-même ne date que du 11e Congrès international de 1966 à Manille, lieu de notre prochain Congrès mondial. • Il y a 25 ans, le 9 novembre 1989, la chute du mur de Berlin fut le prélude à l’ouverture des frontières d’Europe de l’Est, et de nombreux pays purent alors rejoindre la FEAMC (Pologne, République Tchèque, Slovaquie, Hongrie, Slovénie, Croatie, Roumanie, Ukraine, Lituanie…) doublant presque son effectif initial, et renouvelant sa vigueur. Notre réunion du 7 juin à Bratislava nous a rappelé que notre 10e Congrès s’y était tenu il y a 10 ans déjà, et nous avons eu la joie d’y retrouver – pour la première fois au cours d’une simple réunion de bureau – les représentants de 18 pays européens. Cette réunion fut enrichie par la présence de Mgr Zimowski, Président du Conseil Pontifical. Après le Congrès Mondial de Manille début octobre, notre prochaine réunion européenne se tiendra fin novembre à Vienne, où nous ne nous étions pas réunis depuis 1991. 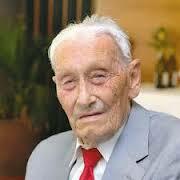 We can distinguish three periods in the history of the international movement of Catholic doctors. The first period is mostly French. 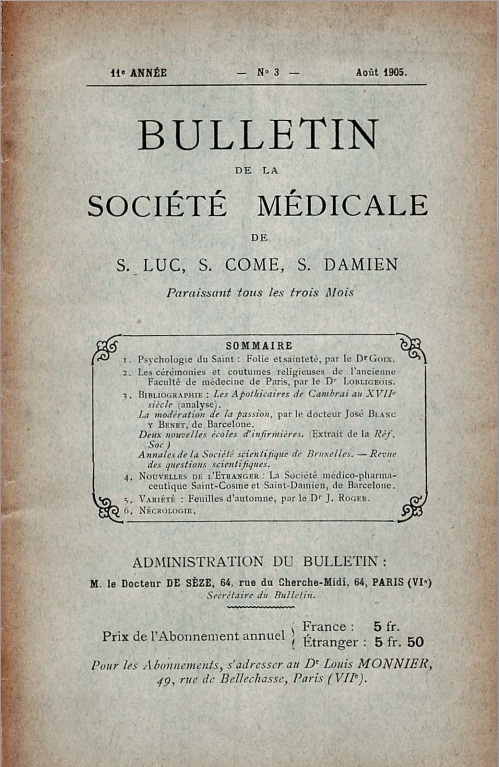 The creation of the “Medical Society St. Luke, St. Cosmas and St. Damian” by a surgeon in Le Mans in 1884, following the appeal of Leo XIII, is a reference for the entire Catholic medical movement. This association expands rapidly: 500 members in 1888, 1,000 in 1907 and 1,500 in 1927. Other Catholic Medical Associations emerge: USA in 1912, Portugal in 1915, Belgium in 1922, then Germany, Austria, Denmark, Great Britain, Hungary, Italy, Luxembourg, Poland, Switzerland, Czechoslovakia, and on other continents (Argentina, China, Tunisia). The second period is mostly European. • Brussels 1935 (1st International Congress): delegates come from Europe, United States, Colombia, and Chile. • Lisbon 1947 (3rd International Congress): delegates come from Europe, Brazil, Canada, and Chile. • Rome 1949 (4th International Congress). A second secretariat, affiliated to Pax Romana (where there are also secretariats of writers, scientists, chemists, engineers, lawyers …), is created and lasts until 1962. • Dublin 1954 (6th International Congress): delegates come from Europe, and United States, India, Japan, and Mexico. • The Hague 1956 (7th International Congress). Delegates come from Europe and the United States. • Brussels 1958 (8th International Congress). 3 000 participants come from 7 different health professions and more than 40 countries. Delegates from Asia (Japan, Philippines, and Viet Nam) decide to create an Asian Federation (the 1st Congress takes place in Manila in 1960). • London 1962 (10th International Congress). 700 participants come from 34 countries on all continents, including Africa (Nigeria, Tanganyika, Zimbabwe), Asia (India, Sri Lanka, Hong Kong, Japan, Taiwan, Vietnam, Philippines), and Oceania (Australia, New Zealand). The International Congress will now take place every four years. 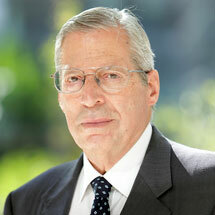 A working group “Europe” is created, and chaired by Jean Lereboullet (France). • Malta 1964 (First European Congress). 400 participants come from 20 countries, including Germany (FRG), Austria, Belgium, Denmark, Finland, France, Great Britain, Holland, Ireland, Italy, Malta, Portugal, Sweden, Switzerland, but also Australia, and USA. 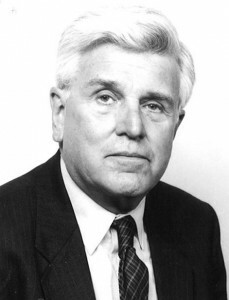 Jean Lereboullet is elected president, and remains in office until 1980. The third period is world-wide. It begins in 1966 by the Congress in Manila (Philippines), where the statutes of FIAMC are voted. 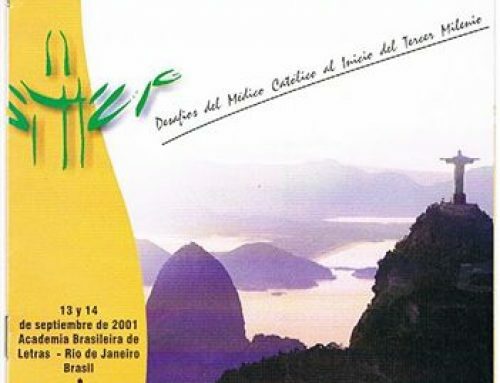 From then on the International Congresses are held on all continent where there are organizations of Catholic Doctors: Washington in 1970, Barcelona in 1974, Bombay in 1978, Rome in 1982, Buenos-Aires in 1986, Bonn in 1990, Porto in 1994, New York in 1998, Seoul in 2002, Barcelona in 2006, and Lourdes in 2010. • FEAMC has its first statutory meeting in 1971, then a Congress every 4 years: Nuremberg in 1972, London in 1976, Brussels in 1980, Lisbon in 1984, Versailles in 1988, Venice in 1992, Prague in 1996, Rome for the Jubilee Year 2000 (in conjunction with the Congress of AMCI, and an extraordinary congress of FIAMC), Bratislava in 2004, and Gdansk in 2008. The fall of the Iron Curtain in 1989 allows the associations of eastern european countries to become active (as evidenced by the Congresses of Prague, Bratislava and Gdansk). FEAMC currently includes 22 countries and is the largest continental federation. • AFCMA (Asiatic Federation of the Catholic Medical Associations) is created in 1958. The International Congresses in Manila in 1966, Bombay in 1978, and Seoul in 2002, testify to its activity. Are currently members the associations of twelve countries (Korea, Hong Kong, India, Indonesia, Japan, Malaysia, Pakistan, Philippines, Singapore, Sri Lanka, Taiwan, and Thailand), and it has links with the Australian Federation. • In Africa, ten countries (Angola, Benin, Burkina Faso, Ivory Coast, Ghana, Kenya, Rwanda, Tanzania, Zimbabwe and Madagascar) had – for a variable period – an association of Catholic doctors member of FIAMC, but the sustainability of these associations has been conditioned by the problems of political stability. • In North America, until recently, existed only the CMA (Catholic Medical Association), founded in 1932, which involved up to 10,000 doctors, not only from the USA, but also from Canada, and Puerto Rico. A Canadian association in Manitoba existed until about 1998. A new Canadian Federation of Associations has just been established, and includes today several Canadian states. There is also (at least since 1990) an english language association in Jamaica. • In Australia, there are Catholic Medical Associations in several states. An Association existed in New Zealand until 1998. ***Today, the number of members of several western associations is lowering, as they have difficulties to gather young physicians. These problems sometimes led to jeopardize their very existence (Austria, Luxembourg, Malta, Venezuela, Trinidad and Tobago, New Zealand …). Facing this disappearances we must ask the right questions, as the current possibilities of communication can make heard, much better than a few years ago, the voice of the Catholic doctors at continental and world-wide levels. On peut distinguer trois périodes dans l’histoire du mouvement international des Médecins Catholiques. La création de la “Société Médicale St-Luc, St-Côme, et St-Damien” par un chirurgien du Mans, en 1884, suite à l’appel de Léon XIII, est une référence pour l’ensemble du mouvement médical catholique. Cette Société s’étend rapidement: 500 membres en 1888, 1 000 en 1907, et 1 500 en 1927. D’autres associations médicales catholiques voient le jour: aux Etats-Unis en 1912, au Portugal en 1915, en Belgique en 1922, puis en Allemagne, Autriche, Danemark, Espagne, Grande-Bretagne, Hongrie, Italie, Luxembourg, Pologne, Suisse, Tchécoslovaquie en Europe, et sur d’autres continents (Argentine, Chine, Tunisie). La deuxième époque est surtout européenne. • Bruxelles en 1935 (1er congrès international): délégués d’Europe, Etats-Unis, Colombie, et Chili. • Rome en 1949 (4e Congrès international). Un deuxième secrétariat, affilié à Pax Romana (où existe également des secrétariats d’écrivains, de chercheurs scientifiques, de pharmaciens, d’ingénieurs, de juristes…), est créé et dure jusqu’en 1962. • Dublin en 1954 (6e Congrès international). Délégués d’Europe, et des Etats-Unis, d’Inde, du Japon, et du Mexique. • La Haye en 1956 (7e Congrès international). Délégués d’Europe, et des Etats-Unis. • Bruxelles en 1958 (8e Congrès international). 3 000 participants de 7 différentes professions de santé et de plus de 40 pays. Les délégués asiatiques (Japon, Philippines, Viet-Nam) prennent la décision de créer une Fédération Asiatique (dont le1er Congrès se tient à Manille en 1960). • Munich en 1960 (9e Congrès international). Présence de 400 participants de 24 pays (parmi lesquels les Philippines, et le Vietnam). • Londres en 1962 (10e Congrès international). 700 participants viennent de 34 pays de tous les continents, et notamment d’Afrique (Nigeria, Tanganika, Zimbabwe), d’Asie (Inde, Sri-Lanka, Hong-Kong, Japon, Taiwan, Vietnam, Philippines), et d’Océanie (Australie, Nouvelle- Zélande). Les Congrès internationaux auront désormais lieu tous les quatre ans. Création d’un groupe de travail “Europe”, présidé par Jean Lereboullet (France). • Malte en 1964: C’est le premier Congrès européen. 400 participants viennent de 20 pays, dont: Allemagne (RFA), Autriche, Belgique, Danemark, Espagne, Finlande, France, Grande-Bretagne, Hollande, Irlande, Italie, Malte, Portugal, Suède, Suisse, mais aussi Australie, et Etats-Unis. Le président élu est Jean Lereboullet, qui le restera jusqu’en 1980. Elle commence en 1966, par le Congrès de Manille (Philippines) où sont votés les statuts de la FIAMC. Désormais les Congrès internationaux ont lieu sur tous les continents où existent des organisations de Médecins Catholiques: à Washington en 1970,Barcelone en 1974, Bombay en 1978, Rome en 1982, Buenos-Aires en 1986, Bonn en 1990, Porto en 1994, New-York en 1998, Séoul en 2002, Barcelone en 2006, et Lourdes en 2010. • La FEAMC, a sa première réunion statutaire en 1971, puis réunit un Congrès tous les quatre ans: à Nuremberg en 1972, Londres en 1976, Bruxelles en 1980, Lisbonne en 1984, Versailles en 1988,Venise en 1992, Prague en 1996, Rome pour l’année jubilaire 2000 (en même temps que le congrès de l’AMCI, et qu’un Congrès extraordinaire de la FIAMC), Bratislava en 2004, enfin Gdansk en 2008. La chute du rideau de fer en 1989 permet aux Associations des pays de l’est d’avoir une présence active (dont témoignent les Congrès de Prague, Bratislava, et Gdansk). La FEAMC regroupe actuellement 22 pays, et est la plus importante fédération continentale. • L’AFCMA (Asiatic Federation of the Catholic Medical Associations) est créée en 1958. Les congrès internationaux de Manille en 1966, de Bombay en 1978, et de Séoul en 2002 témoignent de son activité. Elle regroupe actuellement les associations d’une douzaine de pays (Corée, Hong-Kong, Inde, Indonésie, Japon, Malaisie, Pakistan, Philippines, Singapour, Sri Lanka, Taiwan, Thailande), et a des liens avec la Fédération Australienne. • En Afrique, une dizaine de pays (Angola, Bénin, Burkina-Faso, Côte d’Ivoire, Ghana, Kenya, Rwanda, Tanzanie, Zimbabwe; et Madagascar) ont eu – pendant une durée variable – une association de médecins catholiques membre de la FIAMC, mais la pérennité de ces associations a été conditionnée par les problèmes de stabilité politique. • En Amérique de Nord, jusqu’à une période récente, seule existait la CMA (Catholic Medical Association), créée en 1932, et qui a regroupé jusqu’à 10 000 médecins, non seulement aux Etats-Unis, mais aussi au Canada, et à Porto-Rico. Il a existé jusque vers 1998 une association canadienne dans le Manitoba. Une nouvelle Fédération d’Associations canadiennes vient d’être créée, et regroupe aujourd’hui plusieurs états canadiens. Il existe aussi (au moins depuis 1990) une association de langue anglaise en Jamaïque. • En Australie, il existe des Associations médicales Catholiques dans plusieurs états. Il a existé une Association Néo-zélandaise jusqu’en 1998. ***Aujourd’hui, plusieurs associations occidentales connaissent des problèmes d’effectifs, et ont notamment des difficultés à rassembler les jeunes médecins. Ces difficultés vont parfois jusqu’à remettre en question leur existence même (Autriche, Luxembourg, Malte, Venezuela, Trinidad et Tobago, Nouvelle-Zélande…). Il faut se poser les bonnes questions face à ces disparitions, car les possibilités actuelles de communication permettent de faire entendre, beaucoup mieux qu’il y a quelques années, la voix des médecins catholiques au niveau continental et mondial. Avant que la FEAMC ne soit statutairement fondée, de nombreuses réunions et activités avaient déjà eu lieu avec des médecins chrétiens répondant au désir exprimé par le Pape Léon XIII, d’encourager la réflexion chrétienne des laïcs professionnels et leur action au sein de leur travail.Le premier effort de coordination des différentes Associations de médecins catholiques remonte à 1924, avec la création, à l’initiative d’un Français, le Dr Pasteau, d’un “Secrétariat international des médecins catholiques”. Plusieurs congrès internationaux se tinrent alors en Europe: Budapest en 1930, Paris en 1934, Bruxelles en 1935, Vienne en 1936 (où furent condamnées les théories racistes nazies). Interrompus par les conflits mondiaux, ces congrès reprirent, après la guerre, à Lisbonne d’abord en 1947, à Rome en 1949, puis en 1951 à Paris, où fut décidé le principe d’une Fédération Internationale de Médecins Catholiques, le secrétariat étant assuré par l’Association Belge. La création officielle, statutaire, de la FIAMC n’aura lieu qu’en 1966, au congrès international de Manille. A la suite de la seconde guerre mondiale, dans la mouvance du dynamisme de laïcs ayant particulièrement pris conscience de la nécessité de promouvoir la dignité et la valeur de la personne humaine, si malmenées par l’intoxication des idéologies dominantes du national-socialisme et de sa haine de l’Evangile, et du communisme, de nombreux médecins européens se sentirent interpellés. Ils ressentaient la nécessité d’une réflexion commune responsable, d’un travail plus spécifique et approfondi des nouveaux problèmes posés à la profession. Ces difficultés venaient, d’une part de l’évolution scientifique et technique, d’autre part de la découverte de l’utilisation possible de la science médicale dans des actes commandés par des gouvernements, totalement contraires à la dignité humaine, ayant acculé au péril de leur vie, à l’héroïsme, voire à la mort, bon nombre d’entre eux. Hitler avait avancé l’eugénisme et la prétendue génétique d’alors pour justifier les camps de concentration. En URSS, et dans les pays communistes, le pouvoir politique utilisait les arguments de la psychiatrie pour justifier les goulags, le travail forcé et la mort. La norme de pensée et d’action étant fixée, tous ceux qui s’en écartaient relevaient alors de la pathologie, et étaient exclus de la société. En 1962, au congrès de Londres, fut ainsi décidée la création d’un Groupe de travail “Europe”. Cette première commission européenne, élue, était composée des Drs Lereboullet (France), Mercadal Peyri (Espagne), Jennings (Irlande), Palmieri (Italie), Vassalo (Malte), O’Sullivan (Grande-Bretagne), De Vreeze (Pays-Bas). Elle organisa, en 1964, le premier Congrès européen à Malte. Il avait pour thème: “Le médecin catholique et la famille“, et réunissait 400 délégués venus de 20 pays différents autour de nombreux orateurs de grande valeur. 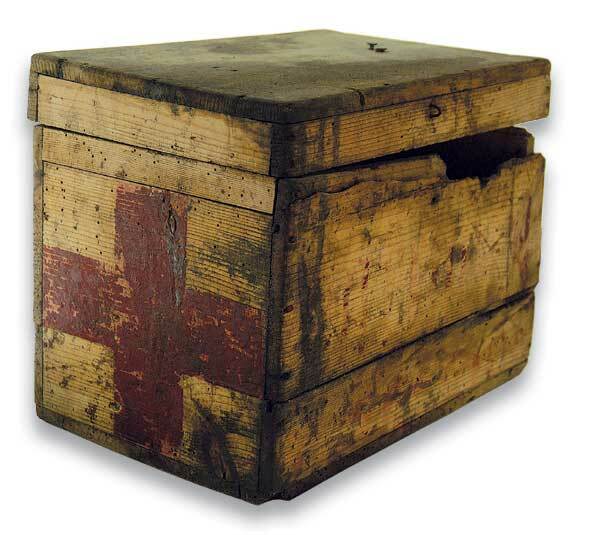 Il était organisé par les médecins maltais, présidés par le Pr V Vassalo. II était placé sous le patronage de son Excellence Sir Maurice Dorman, Gouverneur de Malte, de Son Éminence Monseigneur Michaël Gonzi, Archevêque de Malte, de Sir EG Borg Olivier, premier ministre de Malte. Le Pr L Gedda, président du Secrétariat International des Médecins Catholiques, constitué lors du Congrès International à Paris, en 1951, transmit un message de SS le Pape Paul VI dans lequel il soulignait le rôle du médecin catholique et l’importance que l’Eglise attache aux résultats du Congrès. Il insistait sur la nécessité, pour les médecins, comme pour les laïcs en général, de prendre leurs responsabilités et de collaborer avec les moralistes et la hiérarchie, à l’élaboration d’une doctrine familiale chrétienne. Au cours de l’Assemblée Générale, eut lieu la confirmation officielle de ce Groupe de travail chargé de mettre au point les statuts et l’organisation régionale que réclamaient toutes les Associations européennes. – la nécessité d’une connaissance sérieuse et scientifique des différents problèmes soulevés, et d’une compétence personnelle..
– la prise en compte de la totalité de la personne et la mise en garde contre l’illusion du totalitarisme d’un moyen, quelqu’il soit (la pilule contraceptive, faisait alors l’objet de nombreuses controverses). – l’appui sur la prière de Dieu qui ne fait jamais défaut aux hommes de bonne volonté. “Des médecins, provenant de vingt nations différentes, assemblés pour le 1er Congrès Européen des Médecins Catholiques les 7, 8, 9 septembre 1964, après avoir entendu de nombreux rapports sur le problème de la régulation des naissances, croient de leur devoir de signaler à leurs collègues, chrétiens ou non, l’urgente nécessité d’acquérir une connaissance personnelle, sérieuse et scientifique de ces questions de manière à être réellement capables de conseiller des couples confrontés à de telles difficultés”. Ils croient devoir mettre en garde leurs collègues, tous les ecclésiastiques, et le public contre l’illusion qu’une pilule quelconque pourrait, demain, résoudre un problème qui requiert par dessus tout que les couples mariés aient une vision complète et généreuse de toutes les conditions d’une vie conjugale pleinement humaine, et en même temps acquièrent une maîtrise de leurs instincts possible progressivement avec la prière de Dieu qui ne fait jamais défaut aux hommes de bonne volonté. Parallèlement, en 1965, le Concile Vatican Il réaffirmait à plusieurs reprises le caractère intangible de la vie humaine, de sa dignité et de sa liberté, la dignité et la valeur de la personne humaine à promouvoir et à défendre constituant un point ferme dans l’anthropologie et la morale chrétiennes. Il insistait sur l’importance de la formation des laïcs et sur leur rôle irremplaçable dans l’Eglise. Dans le message adressé en 1965 aux “hommes de la pensée et de la science”, les Pères du Concile soulignaient que “si penser est une grande chose, penser est d’abord un devoir et une responsabilité. Jamais peut-être n’est si bien apparue qu’aujourd’hui la possibilité d’un accord profond entre la vraie science et la vraie foi, servantes l’une et l’autre de l’unique vérité”. Après plusieurs réunions, le 26 Février 1967, à Bruxelles, des délégués de la plupart des Associations Européennes se réunissaient pour élire leur comité provisoire fondateur. Il était formé par: le Pr Lereboullet (France), Président, les Drs De Gheldere (Belgique), Mercadal Peyri (Espagne), O’Sullivan (UK), Vice-présidents, Mr De Vreeze (Pays-Bas), Secrétaire général, le Dr O Jungo (Suisse) Trésorier, les Drs Kohne (RFA), Kerger (Luxembourg), le Pr Cordeiro (Portugal), le Dr Vassalo (Malte), membres. A la satisfaction des représentants, le RP Riquet, sj, acceptait d’en rester le conseiller ecclésiastique. En Octobre 1970, lors du Congrès International de Washington, le Comité européen, constitué à Bruxelles trois ans plus tôt, prend officiellement le nom de “Fédération Européenne des Associations de Médecins Catholiques” (FEAMC). Le 17 Janvier 1971 a lieu, à Paris, la première réunion statutaire du Bureau de la FEAMC au cours de laquelle le Pr Lereboullet (dont le grand esprit chrétien, et l’action toujours discrète, mais visionnaire et efficace a été déterminante dans cette création) est élu Président à l’unanimité. Il le restera jusqu’en 1984, date à laquelle le Vatican reconnaîtra ses services en lui attribuant le titre d’officier de l’Ordre de St-Grégoire-le-Grand. A côté des réunions bisannuelles réservées aux délégués de chaque pays membre, les congrès s’organisent alors tous les quatre ans. Ils sont le lieu des principales rencontres où tous les médecins catholiques européens qui le désirent, peuvent venir échanger avec leurs confrères leurs différents points de vue, apprendre à confronter les modes d’exercice liés à leur mentalité, leurs traditions, leurs coutumes, leur histoire, à se respecter dans leurs différences, et à créer des relations de confiance, d’estime et d’amitié. Après le premier congrès de Malte, avait eu lieu une réunion du Groupement européen au sujet des problèmes de réanimation, des critères de la la mort, de la transplantation d’organes, en 1969. 1972: Le 2ème Congrès de la FEAMC eut lieu à Nuremberg, du 23 au 28 mai, sur le thème de “L’éducation sexuelle, développement et intégration personnelle de la sexualité“. Le congrès était organisé par l’Association des Médecins Catholiques Allemands (Katholischen Arztearbeit Deutschlands), présidé par le Pr MP Engelmeir, le Pr J Lereboullet et le Dr Mercadal-Peyri, organisé par les Drs H Kurth, SE Szydzik, C Kuhne et I Wessels. Les discussions, en groupes de travail, mirent en lumière l’importance de la mutation dans la société de la “révolution sexuelle” trop longtemps taboue, que les événements dits de “mai 68” mettaient en évidence, et qui fut parfaitement soulignée par le Pr M Basquin et le Dr M Pole, dont les exposés furent particulièrement remarqués (St-Luc Médical 1972, 4; Arzt und Christ 18.Jahrgang, 1972, 3 et 4). Le Dr Bleistein souligna la nécessité du recours à des normes, préconisa une pédagogie destinée à assumer une morale sexuelle dynamique par un équilibre entre “un amour de soi et un amour d’autrui”. Participaient 120 médecins de 10 nations: Allemagne, Autriche, Belgique, France, Grande-Bretagne, Italie, Luxembourg, Suisse, et même trois Polonais, plus les accompagnants. Au cours de l’Assemblée générale, le Professeur Lereboullet fut réélu Président de la FEAMC à l’unanimité, et le Dr Kerger (Luxembourg) devint secrétaire général. Démissionnaire en 1974 pour convenance personnelle, il sera remplacé en 1974 par le Dr Françoise Gontard. 1976: Le 3ème Congrès se tint à Londres, du 23 au 26 mai. Il rassemblait 300 délégués, et avait pour thème “Le médecin devant la législation”. 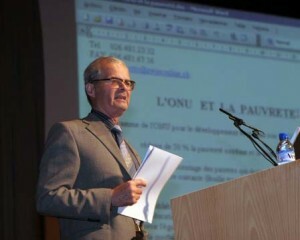 Il était présidé par le Dr TP Linehan, Président de la Guild of Catholic Doctors of Great Britain, et le Pr Lereboullet, président de la FEAMC. Le comité organisateur comprenait les Drs M Reynold, D Conway, F Birks, J Glancy, J Martin, D Mulvany, K Rees, W Reynolds, KP Roche. Au comité d’Honneur, étaient présents SE le Cardinal Gordon J Gray, SE le Cardinal Suenens, plusieurs évêques anglais, et Mgr Lorenzetti, Conseiller ecclésiastique de la FIAMC. Le délégué Apostolique, Mgr Bruno Heim, s’adressa aux congressistes: “L’objectif du congrès est d’étudier les moyens par lesquels les médecins catholiques peuvent apporter une contribution positive à l’élaboration de mesures législatives, sans attendre que les législations soient déjà concrétisées”. – l’importance de la relation médecin-malade-institution, l’attitude d’écoute et de dialogue sous-tendant la préoccupation du respect de la personne dans sa dignité d’homme et de fils de Dieu. – la nécessité pour chaque médecin d’approfondir sa réflexion et sa qualité de responsabilité pour pouvoir devenir de plus en plus libre d’interpréter les lois en fonction de la personne sans s’attacher exclusivement au légalisme de méthodes à appliquer, le but essentiel étant, par exemple, de promouvoir une qualité d’amour plutôt que de défendre un moyen contraceptif précis. – la nécessité absolue, pour le médecin, vivant de plus en plus dans une société pluraliste, de s’attacher à la liberté de conscience et de croyance. La loi récente française sur l’avortement, par exemple, comporte “la clause de conscience” garantissant à tout médecin la liberté de refuser ou d’exécuter un acte. Il incombe aux organisations professionnelles de veiller au respect de cette disposition fondamentale. – l’importance de participer, autant que faire se peut, à l’élaboration des différentes législations sociales en vue de valoriser le respect de la personne humaine. – l’approfondissement permanent d’une vie chrétienne de foi, d’espérance et d’amour pour mieux connaître et découvrir la valeur d’une vie responsable et libre. Au cours de l’Assemblée Générale, Le Pr Lereboullet était réélu à l’unanimité Président de la FEAMC, et le Dr F Gontard secrétaire générale. 1980: Le 4ème Congrès de la FEAMC eut lieu à Bruxelles, du 14 au 17 mai. Il avait pour thème: “Médecin catholique aujourd’hui“. Il était présidé par le Dr P Marchandise, Président de l’Association belge, et placé sous le patronage de Sa Majesté la Reine Fabiola, SE Mgr Cardinale (Nonce Apostolique), SE Mgr Danneels, le Ministre de la Santé publique L.D’Hoore, Mgr Massaux, Recteur de l’Université Catholique de Louvain (UCL), et du Pr De Somer, recteur de la Katholieke Universiteit Leuven (KUL). Il rassemblait plus de 300 médecins, venus d’Allemagne (RFA), Belgique, Danemark, Espagne, Etats-Unis, France, Grande-Bretagne, Italie, Pologne, Portugal, Rhodésie, Suisse. Le comité organisateur comprenait les Drs Buys, Deschepper, Fanuel, Kluyskens, Lederer, Lethé, Morelle, Orban, Thuillez, Vandenberghe, Vangehuchten, Verstraete. Le Dr C De Gheldère en était le secrétaire général, et le Dr Kluyskens présidait les séances, avec le Pr Lereboullet (Président de la FEAMC), le RP Frison, sj (Conseiller ecclésiastique de la FEAMC), et le Dr G Papola (de la FIAMC). Après une messe solennelle à la Collégiale St-Michel, une réception eut lieu à l’Hôtel de Ville de Bruxelles, au cours de laquelle le Pr Lereboullet ouvrit le congrès. Les séances eurent lieu ensuite au palais du Heisel. Au terme de discussions souvent passionnées, le RP Riquet accepta de faire une synthèse de très haute tenue spirituelle et éthique, basée sur sa très grande connaissance du milieu médical, qui fut très chaleureusement applaudie par tous les participants. – Devoir d’accueil et d’aide. • constate que le respect de la vie est inscrit dans la loi naturelle, qu’il est le fondement des droits de l’homme. • affirme que la personne humaine a reçu la vie en don, et qu’il en résulte des devoirs dans l’usage de cette vie. • affirme que la science médicale et les médecins sont tenus de respecter la personne humaine, depuis sa conception jusqu’à sa mort; qu’il ne peut être porté atteinte à l’intégrité de l’individu. • exige que la liberté de conscience du médecin soit respectée. Le congrès se clôtura par une messe solennelle concélébrée dans la salle du congrès, présidée par Mgr Danneels, Primat de Belgique. Le Dr P Deschepper fut désigné comme successeur du Dr F Gontard, au poste de secrétaire général. Le Pr W Osswald et le Dr J Amaral proposèrent la candidature du Portugal comme pays d’accueil du prochain congrès, à Lisbonne et Fatima, haut-lieu de chrétienté et de prière. 1984: Le 5ème Congrès de la FEAMC eut lieu à Lisbonne – Fatima, en mai. Il avait pour thème “La Médecine face aux nouveaux pouvoirs“. Remarquablement organisé par le Pr Osswald, il commença, bien sûr, par une Concélébration eucharistique, dans la cathédrale de Lisbonne, le reste du Congrès se déroulant à Fatima, haut-lieu marial bien connu. Celui qui est leur Vie profonde, ne peuvent oublier que leur but est d’aider leurs frères hommes à devenir plus hommes, et que leur rôle comprend d’accompagner, d’aider, de conseiller ceux qui se confient à eux. 2) Éthique des relations médecin-malade en psychiatrie (L Cassiers, Louvain; D Parellada, Barcelone; G Roth, Vienne; R Degkwitz, Fribourg-en-Br; S Spencer, Oxford) qui ont abordé les difficultés pratiques du respect, dans la relation psychiatrique, du salut du sujet humain, de son libre-arbitre, et de son droit à l’autodétermination. d) Risques et limites dans les essais thérapeutiques (Pr C Laroche; Pr A Nenna, Paris, France). Aux nouveaux pouvoirs des médecins dans ces essais, correspondent de nouveaux devoirs, ceux d’une haute qualification scientifique, du respect du malade traité, dont le consentement doit être libre et éclairé, du contrôle par des commissions d’éthique: “Toute activité scientifique s’enracine dans une éthique de la croissance au service de l’homme” (cf le Code de Nuremberg, la Déclaration d’Helsinki, le Code de Déontologie Français). 4) Communications: Ont encore participé à ce Congrès: L Reale (Rome), J Stevens (Hollande), C Henrich (Coblence), D Ruosi et G Gigli (Naples), I Van der Plaetsen (Gand), M Perez Jover (Alicante), P Trafford, Bristol), J Kohne (RFA), J. Battig-Mettler (Suisse), J Lederer (Belgique), M. Glockler (Vienne), A Gameiro (Lisbonne), P Jouannet (Paris), J Pinto Mendes, A Robalo-Cordeiro (Coimbra), F Gontard (Paris, France). “On cherchera en vain dans ce congrès des définitions dogmatiques ou des instructions précises sur le comportement pratique du médecin catholique en face des difficiles problèmes éthiques que soulèvent les nouveaux pouvoirs. Une immense somme de connaissances, des travaux lucides et de haute qualité scientifique seront alliés à l’attitude pleine d’humilité de ceux qui, partageant un profond respect pour la vie, savent qu’ils commettent des erreurs et que leur vision de la vérité est partielle” (Pr W Osswald). “Tout est à vous, mais vous êtes au Christ, et le Christ est à Dieu” (1 Cor 3, 23). L’impression de tous les textes, effectuée avant le congrès, permettait à chacun de profiter au mieux des interventions. Au cours de l’Assemblée Générale, les mandats du Président, le Dr Kluyskens, et celui du secrétaire général, le Dr Deschepper furent reconduits. Le prochain pays d’accueil choisi fut la France. Le 6ème Congrès de la FEAMC se tint en France, à Versailles, du 8 au 11 mai 1988, sous le patronage de Mr J Chirac, Premier Ministre, Mr JB Raymond, Ministre des Relations Extérieures, Son Excellence Mgr Felici, Nonce Apostolique, Me A Damien, Maire de Versailles. Le Comité d’Honneur était formé par le Cardinal Lustiger, Archevêque de Paris, Mgr Simonneaux, Évêque de Versailles, le Pr R Villey, Président Honoraire du Conseil National de l’Ordre, le Père Riquet, sj, premier aumônier de la FEAMC, le Pr J Lereboullet, Président-Fondateur de la FEAMC, le Dr P Charbonneau, Président du CCMF, le Pr C Laroche, Directeur de “Médecine de l’Homme”. Les invités d’honneur étaient Mgr Angelini, Pro-Président de la Commission Pontificale de la Santé, le Dr TP Linehan, Président de la FIAMC et Mgr Cassidy, Conseiller Ecclésiastique de la FIAMC. Le Président du Congrès était le Dr J Kluyskens, et la Secrétaire Générale, le Dr F Gontard. Après la Messe d’ouverture célébrée à Notre-Dame de Paris, par Mgr Lustiger, le Congrès se tint au Palais des Congrès de Versailles, sur le thème “Médecine et Liberté“. b) Situation éthique, économique, technique et législative des médecins, dans l’évolution des sociétés européennes: Dr Roth (Autriche); Dr Verstraete (Belgique); Dr Jenssen (Danemark); Dr Massons (Espagne); Dr Marchelli (France); Dr Jessiman (Grande-Bretagne); Dr Ten Have (Hollande); Pr De Franscicis (Italie); Dr Faber (Luxembourg); Dr Porto (Portugal); Pr Wuermeling (RFA); Dr Amarca (Suisse). b) Liberté de transmettre la vie? “C’est à la liberté que vous avez été appelés, car tout est à vous, mais vous êtes au Christ, et le Christ est à Dieu”..
La Foi ne donne ni recette ni formule, mais elle apporte la libération de la liberté pour agir et aimer. La Messe de l’Ascension, célébrée dans la Chapelle Royale du Château de Versailles, permit une superbe expression de l’unité de la Foi de chacun avant la reprise de son travail. Au cours de l’Assemblée Générale, le Président élu fut le Pr A Nenna (Paris, France) en remplacement du Dr Kluyskens et la Secrétaire Générale, le Dr F Gontard, (Paris, France), en remplacement du Dr P Deschepper. La résolution finale de l’Assemblée, fut acceptée à l’unanimité: “Les médecins catholiques de la FEAMC de douze pays européens, réunis en congrès à Versailles, estiment qu’il leur appartient d’assumer leur propre liberté dans l’expression de leur profession et leur compétence avec les responsabilités qu’elles comportent et selon les impératifs de leur conscience chrétienne, éclairée par leur foi et le magistère ecclésiastique”. Le 7ème Congrès de la FEAMC eut lieu à Venise du 25 au 28 mars 1992, et eut pour thème “La médecine à l’aube du troisième millénaire“. Le décès prématuré du Président, le Pr A Nenna, mit le Dr J Kohne (RFA), Vice-Président le plus ancien, comme Président du Congrès. Après la Messe d’ouverture à l’église des Franciscains “dei Frari”, pendant laquelle Mgr Angelini s’adressa aux participants en français, le Congrès eut lieu au très beau “Teatro Goldoni”. Parmi les sciences qui exaltent le progrès de la civilisation, la médecine est plus que toute autre au service de la vie et du progrès de l’humanité. La médecine qui approche l’homme au moment crucial de la souffrance doit faire de celui qui l’exerce, à tous les niveaux, un expert de grande sensibilité humaine. Humaniser signifie être ouvert à la compréhension de tout l’homme, à sa psychologie, à son intériorité, à son monde, à sa culture. Cette dimension d’humanisation doit sous-tendre tous les nouveaux défis de la médecine, qu’ils soient liés aux techniques, à la prolongation de la vie et à la vieillesse, aux différents engagements et aux décisions à prendre dans les instances nationales, européennes ou internationales. Les médecins chrétiens européens sont en faveur de la meilleure qualité de vie possible, dans un monde humanisé. Le Pape Jean-Paul II rappelle dans “Centesimus Annus” qu’il nous appartient de promouvoir une écologie humaine, et une façon de vivre basées sur les principes de l’Évangile. b) Rapports des groupes de médecins catholiques des pays de l’est de l’Europe qui participent pour la première fois à notre Congrès, et que chacun se réjouit d’accueillir. Étaient ainsi représentées: la Bulgarie, la Croatie, la Hongrie, la Pologne, la Roumanie, la République Tchèque, la Slovaquie, la Slovénie, l’Ukraine. L’Assemblée Générale permit d’élire comme nouveau Président le Dr Battig (Suisse), et comme Secrétaire général le Dr Pavesi (Suisse). La République Tchèque propose Prague comme prochain lieu du huitième Congrès Européen, lieu accepté avec joie par les participants. 1996: 8ème Congrès à Prague, superbe ville millénaire, et premier lieu d’accueil d’un congrès européen catholique en Europe de l’Est. Thème: “Médecine d’aujourd’hui et notre image de l’homme“. Grâce au remarquable travail du Pr Marek et du Dr Pohunkova, ce premier congrès en Europe de l’Est rassemblait des délégués de toute l’Europe (en dehors de la Russie). “L’amour de Dieu a été répandu dans nos coeurs par l’Esprit-St-qui nous fut donné (Rom. 5, 5). L’homme est la demeure de cet Esprit”. Ce congrès fut placé sous le patronage de SE Mgr Miloslav Vlk, Cardinal-Archevêque de Prague, et de Mgr G Coppa, nonce apostolique à Prague, du Pr Pavel Kjeiner, Vice-Recteur de l’Université Charles IV de Prague, du Pr Petr Hach, Doyen de la 1ère Faculté de médecine de l’Université Charles IV, du Pr W Osswald, président de la FIAMC, du Dr Deschepper, président de la FEAMC, et de Mgr Angelini. Les nombreuses interventions furent toutes d’un immense intérêt, permettant aux différents pays de mieux se connaître, et de mieux apprécier à la fois les barrières idéologiques et économiques ayant séparé l’Europe de l’Est et celle de l’Ouest et l’esprit chrétien de nos confrères au milieu de multiples difficultés, et souvent dans l’héroïsme. Parmi les orateurs, la communication de Mr Michaud, Président de la Commission de Bioéthique au conseil de l’Europe, au sujet du respect de la vie, élaborée dans la Convention de bioéthique du Conseil de l’Europe, en cours d’élaboration, fut d’un immense intérêt. En effet, tout en apportant de grands bien faits à la condition humaine, la médecine et la biologie comportent aussi en puissance des dérives importantes qu’il importe de bien repérer, et sur lesquelles il est bon de réfléchir, pour pouvoir à la fois en utiliser le dynamisme et en canaliser les excès. La communication du Dr Abiven sur le sens de la souffrance et de la mort fut particulièrement appréciée. Participèrent aussi à ce congrès de nombreux confrères d’Europe de l’Est. 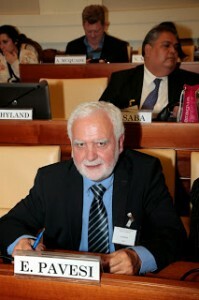 Citons les Drs 0 Andrysek, J Bruthans, P Cejpek, M Cerna, J Hamanova, J Hromada, J Payne, M Svatosova, K Sipr, Z Zadak (République Tchèque); les Dr A Neuwirth et L Soltès (Slovaquie); les Dr M Cyelbar et M Klevisar (Slovénie); les Dr L. Krapac et A Lisec (Croatie); le Dr W. Poltawska (Pologne); le Dr I Louts (Ukraine), le Dr D Rozalia (Roumanie). Au cours de l’Assemblée Générale, le Dr Deschepper (Belgique), qui a assumé la présidence pendant les deux années précédentes, après la démission du Dr Battig pour raison de santé, est de nouveau élu pour cette fonction, aidé du Dr Stevens (Hollande), comme secrétaire général. Le prochain congrès européen coïncidant avec l’année jubilaire, nos confrères italiens acceptent de prendre la lourde responsabilité de son organisation.à Rome. En juillet 2000, année jubilaire, le 9ème congrès a lieu à Rome, avec pour thème: “Médecine et Droits de l’Homme“. La conférence inaugurale prononcée par Mr Michaud est relative à la Convention européenne de bioéthique du Conseil de l’Europe d’Oviedo, objet d’un travail considérable depuis plusieurs années, actuellement signée par 28 pays européens, constituant un consensus éthique de base, impensable il y a peu de temps encore. Sa Sainteté Jean-Paul II, chantre du mystère de la condition humaine appelée à la dignité et à la liberté divinisée par le Christ, et des Droits de l’Homme, nous fais l’honneur de sa présence. Les chrétiens sont porteurs d’un message inouï d’amour et d’espérance. C’est leur relation à Dieu et aux hommes qui constitue leur nature profonde. A eux de devenir, dans la représentation collective, ceux dont la foi et la réflexion transmettent “la Bonne Nouvelle de la liberté des enfants de Dieu”: Liberté de créer, d’innover, d’aimer au niveau des responsabilités familiales, professionnelles, sociales, qui sont les leurs, dans une fidélité à un Évangile libérateur et vivifiant. Puisse la réflexion éthique européenne être à la mesure du progrès scientifique, “le savoir et le pouvoir des serviteurs de la santé être “enrichis des lumières de la spiritualité pour ouvrir des voies vers un meilleur épanouissement de la condition humaine” (Mr Michaud). Puisse aussi la FEAMC continuer à savoir mettre la personne au coeur de la révolution scientifique et de l’économie de marché, accepter les différences entre les cultures, et contribuer à assumer sa responsabilité de “levain dans la pâte” humaine.